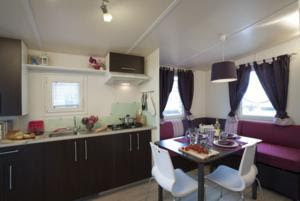 For more information on Camping Badiaccia, visit the listing on ThriftyUmbria.com! Camping Badiaccia is congenially sited on the edges of Trasimeno Lake. Encircled by the flourishing knolls of green Umbria, it proposes a wonderful starting place for expeditions to the most essential archaeological and cultural sites of Italy. Badiaccia is the spot to stay for those in pursuit of a calming holiday in a friendly environment. The attentive and experienced personnel is largely supportive in getting the most out of your sojourn, supported with high standard facilities, which are complimentary, such as: hot showers, reserved beach, two swimming pools, tennis pitch, beachvolley, football, basketball, bocce, minigolf, playing field, TV area and a team of animators who will cheer up your days with performances, games, child club, party nights and more. During the morning and in the afternoon a multi language and experienced staff arranges a program made of tournaments and very funny sports competitions to divert the youngest visitors. For sport enthusiasts the camping provides plenty of alternatives, while the lake offers the chance to practice different water sports. The swimming pool for adults is in a vast verdant plot and is an ideal encounter spot both for swimming and tanning fans and for visitors looking for rest. The swimming pool for kids is on the Trasimeno Lake coast and presents the possibility of having amusement with numerous water games. The camping includes a sizable sandy beach delimited by verdant lawn. You may use deck chairs and seaside umbrellas without charge, and let kayaks and water-bikes. Camping Badiaccia also features a broadband Internet Point and WiFi. Among the accommodations offered are cottages, mobilehomes and chalets. Separated from the camping grounds and on the edge of the Trasimeno Lake you can moreover rent Umbria apartment homes and private villettes. On site you will discover all conveniences such as a relaxed bar, a diner and a small grocery for your pressing necessities.